Greenville Jazz Labs I & II: Dirty Dozen Brass Band to perform LIVE at GHS! Dirty Dozen Brass Band to perform LIVE at GHS! Are you ready for a little New Orleans Jazz!? In case you haven't heard, the Greenville Big Band Committee and the Greenville Community Center have partnered together to present The Dirty Dozen Brass Band of New Orleans, performing live at the Greenville High School Performing Arts Center on Friday, May 16th at 7:00 p.m. If you haven't already reserved your tickets (which I suggest you do!) there's no need to worry, as tickets are still available at $15 per admission. Tickets are just a phone call away, just pick up your phone to reserve a seat for a night full of bebop, funk and traditional New Orleans Jazz music! Just call (616) 754-9163 to order your tickets NOW! A little about the Dirty Dozen...! Over a 27-year career, The Dirty dozen Brass Band have boldly forged the traditions of New Orleans jazz with the modern influences of bebop, funk, R&B, and pop, creating a new standard by which all other New Orleans groups, brass band or otherwise, are measured. The Dirty Dozen are tireless travelers, maintaining a continuous touring schedule that has taken them to over 65 countries on five continents serving as a bridge between the past and present of New Orleans' rich musical history. The ensemble was established in 1977 by Benny Jones together with members of the Tornado Brass Band. 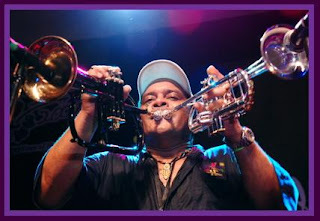 The Dirty Dozen revolutionized the New Orleans brass band style by incorporating funk and bebop into the traditional New Orleans style, and have been a major influence on the majority of New Orleans brass bands since. The New Orleans Jazz Funeral is the ultimate celebration of life and death and is as much a part of the New Orleans social history as Jazz Music itself. 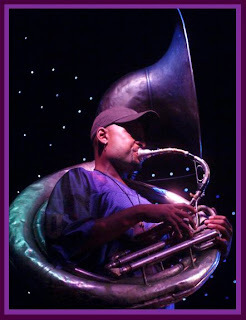 "Funeral for a Friend" takes the Dozen back to where it all began as they re-create a Jazz Funeral from beginning to end, celebrating the life of a special friend, original member, and New Orleans legend, Anthony "Tuba Fats" Lacen, who passed on earlier this year. Slow mournful dirges turn into festive celebrations as the music marches from traditional gospel and blues songs taking the listener out from the church steps and onto the city streets, following the brass band parade to the final home of a dear friend before finding the Dozen talking with the prince of peace "Down by the Riverside." It was rather interesting for me to read that blog. Thanx for it. I like such themes and anything connected to this matter. I definitely want to read more soon. It was rather interesting for me to read that article. Thanks for it. I like such themes and everything connected to them. I would like to read more on that blog soon. Nice blog you got here. It would be great to read more about this theme. Thank you for giving that data. By the way, buy GSM jammer to jam all spy devices in your room or at work. Yes indeed, in some moments I can reveal that I acquiesce in with you, but you may be inasmuch as other options. to the article there is still a without question as you did in the decrease issue of this request www.google.com/ie?as_q=office 2007 ? Validate Our Inoperative Prices at www.Pharmashack.com, The Unequalled [b][url=http://www.pharmashack.com]Online Chemist's boutique [/url][/b] To [url=http://www.pharmashack.com]Buy Viagra[/url] Online ! You Can also Visualize Mammoth Deals When You [url=http://www.pharmashack.com/en/item/cialis.html]Buy Cialis[/url] and When You You [url=http://www.pharmashack.com/en/item/levitra.html]Buy Levitra[/url] Online. We Also Guests a Mammoth Generic [url=http://www.pharmashack.com/en/item/phentermine.html]Phentermine[/url] In shore up of Your Regimen ! We Switch Opprobrium big vip [url=http://www.pharmashack.com/en/item/viagra.html]Viagra[/url] and Also [url=http://www.pharmashack.com/en/item/generic_viagra.html]Generic Viagra[/url] ! Presenting the Dirty Dozen Brass Band! Call (616) 754-9163 For Tickets! Presenting the 8th Annual Jazz Day at Greenville High School! The Improv Box - Express Yourself! Welcome to the homepage of the Greenville High School Jazz Band! Feel free to look around. From checking out video of past concerts, to adding your email to receive updates on future jazz concerts, you should be able to keep yourself busy for a while! If you have any questions or comments about the band for band director Mr. Jeff Ayres, simply post them here! GHS Jazz Band Email Listing! If you would like to receive email updates about upcoming concerts and other Jazz Band related news, then add yourself to the website mailing list! This is also a good way to stay in contact with Band Director Jeff Ayres!